One of the best things about a New Zealand summer is the sudden influx of travellers from other parts of the world. I like meeting people who have come all this way to discover New Zealand, and it’s great to catch up with friends who come ‘home’ for a kiwi Christmas. I love the enthusiasm with which they slip back into their jandals and reconnect with the things that make a New Zealand summer – fishing, camping, crayfish sandwiches, burnt chops and all. A few weeks ago, while holidaying in The Marlborough Sounds, I met up with honorary kiwi Fia Gulliksson, a Swedish chef who used to live and work in Wellington. She’d come back with her family for a friend’s wedding. We got talking and, in line with the 2 degrees of separation that connects kiwis everywhere, we realised we’d met before, years ago when I’d delivered fresh pasta to her and Steve Logan at his restaurant, Brer Fox. The Thorndon restaurant is now Le Canard, the restaurant in which I have a half share. Fia, it turns out, has become a food celeb in her own country. She owns a tea blending company with her partner Martin and is well known for the booked-out dinner events which she hosts in her gorgeous lakeside boat shed. She also presents a food programme on Sweden’s national radio station. While in New Zealand she was filing interviews with producers and chefs for a kiwi-themed programme which I figured was going to demand a great deal of voiceover translation. Scandinavia, once thought to offer little but root vegetables, pickled fish and reindeer, has, thanks to chefs and culinary entrereneurs like René Redzepi and Claus Meyer of Noma restaurant, reinvented a culinary culture that blends local ingredients with equal parts of tradition and innovation. The New Nordic Cuisine, as presented in its own manifesto, has a similar philosophy to Italy’s Slow Food movement. It supports a local artisan culture and it makes good use of plants and berries that are sometimes foraged from the wild and often presented in surprising ways. 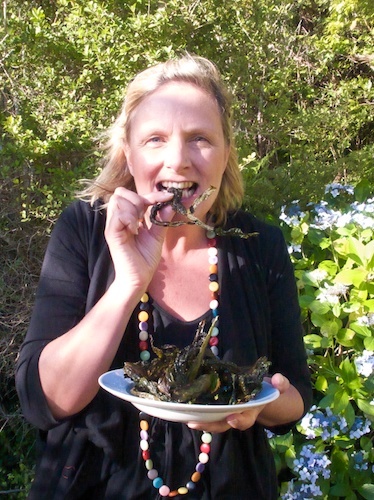 In the Marlborough Sounds, Fia prepared cavalo nero leaves from my friend Jen Scott’s garden. They were roasted in oil and sprinkled with salt and toasted sesame seeds. We ate them as a crispy snack with pre-dinner drinks but they would also make a delicious garnish. 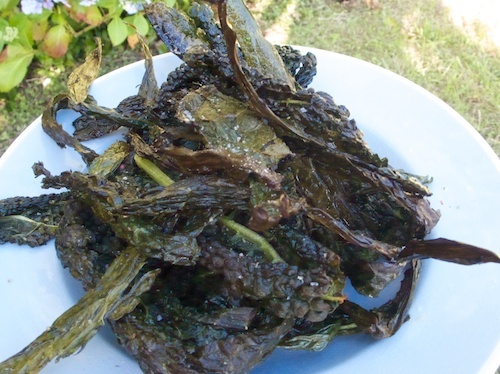 Back home in Sweden, Fia crisps up other types of brassica leaves and sometimes seaweed. If I ever get round to finishing my collection of Marlborough Sounds recipes, this will be in it.